Superior cutting power that finishes down smooth and glossy in one step! Revolutionary new technology that will forever change detailing! Meguiar's has completely changed the detailing landscape with the DA Microfiber Correction Compound that utilizes brand new polishing technology. This compound has the ability to remove swirls, oxidation, ultra fine scratches and more while finishing down extremely smooth in one step! Therefore you can restore your vehicle's paint to a brilliant finish in less time while using less energy. The system was designed to help detailers remove light to moderate surface imperfections, although it is capable of removing heavier defects. The key to this system is the synergy between the most critical components which are the pad, polish and buffer. It is highly recommended that you use the Meguiar's DA Microfiber Correction Compound with Meguiar's DA Microfiber Cutting Disc Buffing Pad and a dual action buffer like the Porter Cable 7424 XP. The entire system was designed around this specific combination of products, which is why it works so well. This special microfiber cutting disc buffing pad works the compound in extremely well and it gives you superb cutting power while leaving an optically clear and glossy surface. A rotary buffer should not be used as this system was designed for a Dual Action buffer like the Porter Cable 7424 XP. A dual action buffer helps you get great results with the safety that comes with these buffers versus rotary buffers. Meguiar's also highly recommends using their backing plates because they have a shorter loop on their model (Meguiar's Professional Backing Plate W67DA 5" or S6BP 6"). This helps reduce the amount of heat generated, which in turn preserves the life of the pad. Thoroughly prime the pad by spreading the compound all around it. Next apply about 2 - 4 small drops to the pad and move very slowly over a 2ft x 2ft area with light pressure at speed 4 - 5. Maximum speed is not required for these polishes unlike most polishes. When you are done hand remove the excess product with a clean microfiber towel and step back and admire the shine. 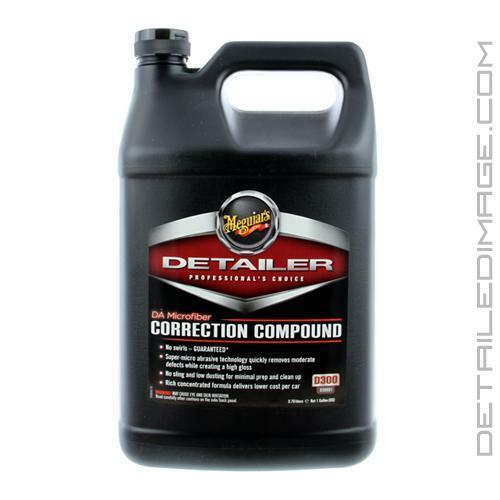 The results are stunning and this product will quickly become a staple in the detailing community world wide! If desired follow up with the new Meguiar's DA Microfiber Finishing Wax to further polish and protect the surface in one step. The D300's ease of use and low dust will definitely make it my new "go to" product for most correction jobs, but when serious correction is needed M105 will still be my heavy hitter. Overall, I'd say this system has exceeded my expectations. It's also very apparent to me that Meguiar's spent a lot of time developing the products. While I expected the polishes and pads to work well, as it's what I've come to expect from Meguiars, it was actually the little things about this system that showed how much thought went into developing these products. This new microfiber system will definitely find its way into most or all detailing shops, and, more importantly, into the hands of DIY enthusiasts' with no rotary experience. It definitely helps to bridge the gap even more between DA polishing and the more aggressive, potentially dangerous, rotary polishing process. I believe the ease of use is what will set it apart from any other competition and make it a favorite to many that have been waiting for some time now. Meguiar's has developed game-changing technology here; particularly on the compounding side of the equation. Heavy defect removal, ease of use, and with the relative safety of using a dual action polisher is a winner in my book! Meguiar's DA MICROFIBER CORRECTION SYSTEM is a unique purpose engineered system of new technology, microfiber pads and liquids for optimal results. Meguiar's DA MICROFIBER CORRECTION COMPOUND utilizes super-micro abrasive technology to quickly remove scratches, acid rain, swirls/holograms and other light to moderate defects on factory paint. Designed for use with Meguiar's DA Microfiber Cutting Disc delivering no sling, low dusting performance for minimal prep and clean up time. DIRECTIONS: SHAKE WELL. Work in the shade on a cool surface. Apply product directly to Meguiar's DA Microfiber Cutting Disc. Set Dual Action Polisher to 4800 opm. Working a 2' x 2' section, apply 2-3 moderate pressure passes followed with 2-3 light pressure passes. Wipe residue off using Meguiar's Ultimate Wipe Detailing Cloth (M9910). PROFESSIONAL TIPS: Clean disc frequently using Meguiar's Pad Conditioner Brush (WPCB) or compressed air via a regulatory approved air nozzle. Been detailing for over ten years and it's the compound I use the most. Very little dust. Hands down the best compound I've ever used! Also I love the fact that it doesn't dust! Quality is A really a top notch product, really helped me step up my game, if you have an opportunity try it out it's awesome. Incredible service. Put me down as a customer for life.